Despite his mastery in wood-cut and engraving, Durer turned exclusively to oil painting while in Venice. Panofsky indicates that Venice and its painters had a great impact on the German master. From his correspondence we know that Durer regarded the aged Giovanni Bellini as still the greatest of painters, but in a letter dated February 7, 1506, Durer mentioned that he had also found “many painters much superior to Jacopo de’ Barbari,” an artist already well-known to Durer before the Italian trip. 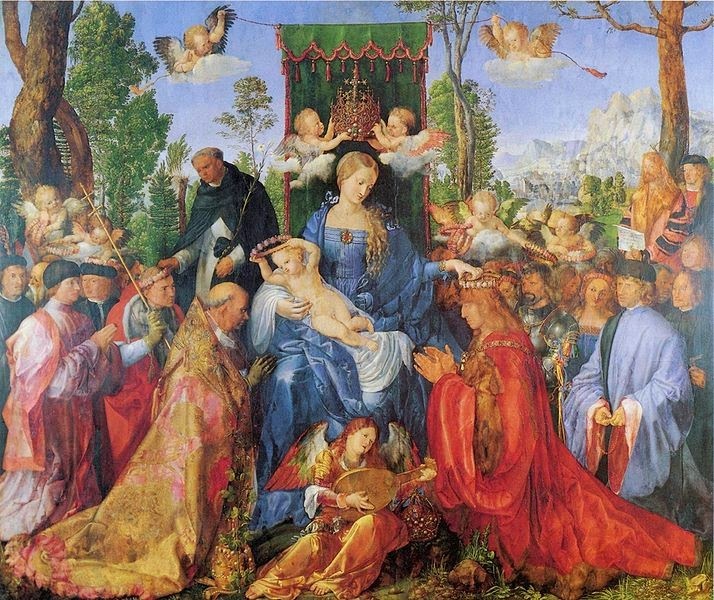 On the completion of the “Feast of the Rose Gardens” Durer, himself, bragged, “I herewith announce that there is no better image of the Virgin in the country.” This claim might be exaggerated but the painting did gain much acclaim. While working on the altarpiece for S. Bartolommeo, Durer also completed two smaller paintings of sacred subjects. The first was the so-called “Madonna of the Siskin”, now in the Staatliche Museum in Berlin. 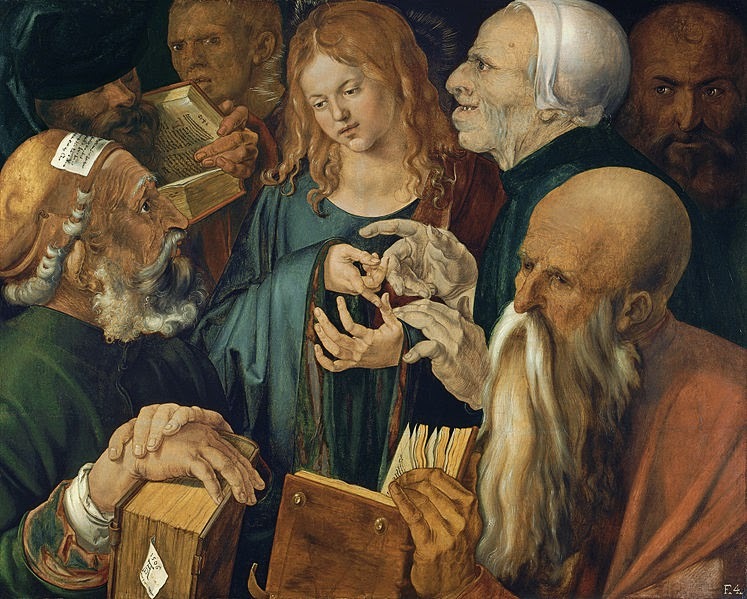 The second was a version of “Christ Among the Doctors” that is now in the Thyssen Bornemisza collection in Madrid. The “Madonna of the Siskin” derives its popular name from the bird on the arm of the infant Jesus. However, it is actually a representation of the meeting of the young John the Baptist with the Holy Family on their return from the sojourn in Egypt. Panofsky notes that the young Baptist is the most significant iconographical feature in the painting. While the Madonna of the Rose Garlands took months to complete, it would appear that “Christ among the Doctors”, the final painting in the Venetian triad, was done in a matter of days. 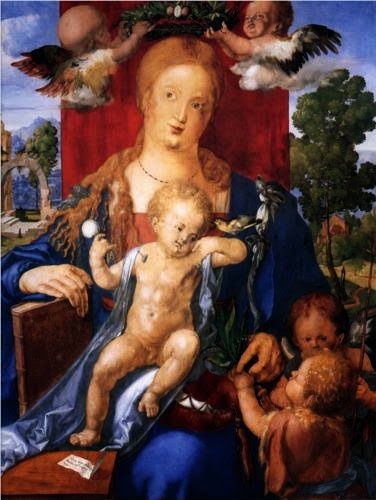 Yet, Durer considered this painting as “something new and extraordinary” and Panofsky concurs. 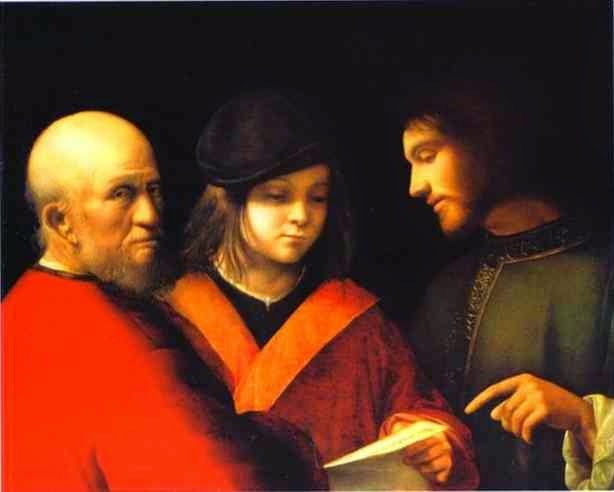 Panofsky’s description of this painting reminds me of the so-called “Three Ages of Man” usually attributed to Giorgione. I have interpreted that painting as a dramatic incident also from the life of Christ: the encounter of Jesus with the Rich Young Man. 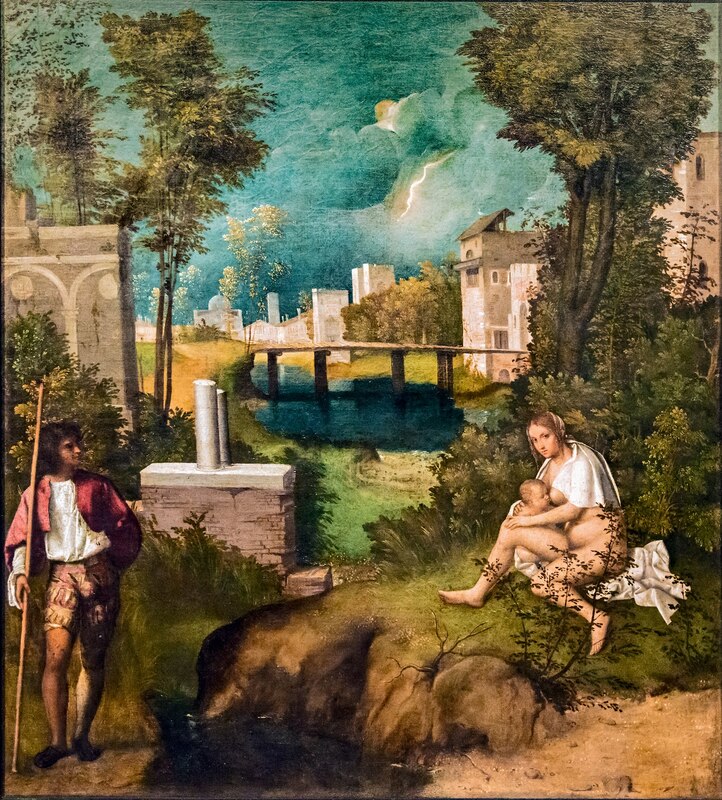 Giorgione, who was working in Venice at the same time as Durer, also used the expressive hands and faces of half-length figures to create an effect. In both paintings the half-length treatment provides a kind of close-up or zoom effect. In the year after Durer left Venice, Giorgione was given the commission to fresco the exterior walls of the newly rebuilt Fondaco dei Tedeschi, the center of German community in Venice. Over the years scholars have tried to find some northern influence on Giorgione’s work, but Panofsky never mentions Giorgione. Instead, he argues that Durer was greatly influenced by what he saw in Venice. After his return to Germany, Durer eventually gave up painting and went back to his wood cuts and engravings. But they would never be the same. His stay in Venice had brought his work to an even greater level. I like to think of him and Giorgione both trying to satisfy the demands of their patrons for sacred subjects while at the same time working to a make their work exceptional and innovative. ***Erwin Panofsky: The Life and Art of Albrecht Durer, Princeton, 1955. Page citations are in brackets. 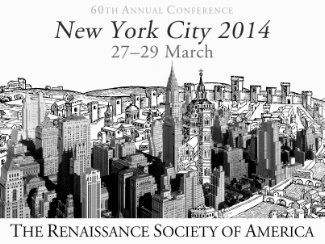 I was really looking forward to attending the annual meeting of the Renaissance Society of America that was held this year in New York City from March 27 to 29. This conference was the sixtieth in the RSAs history and because of the location turned out to be the largest in the Society’s history. The program book came to over 800 pages although an app was available for easy reference. I was only able to attend on Friday but looked forward to hearing from a mixture of leading scholars in the field and younger scholars anxious to establish their credentials. Before going any further I have to say that the panels I attended turned out to be disappointing for a variety of reasons that I will discuss below. First, let me discuss the roundtable mentioned above. The abstract indicated that “this panel will bring together an international, interdisciplinary group of top scholars working in Venetian studies today to examine the current state of the field and to look forward to future directions of research.” There was indeed a distinguished group of professors from various distinguished universities who in turn briefly discussed their own work but in no way indicated any future directions in the field of Venetian studies. One significant omission was the lack of any discussion of the role of the Internet. In his introduction the chairman of the panel spoke at length about a new publication of material from Venetian archives. Apparently, the publisher has printed less than a hundred copies of what sounded like a huge tome. Depending on demand a less expensive paperback version might be available in a few years. Is this where Renaissance studies are going? Why shouldn’t this book be instantly and inexpensively available to a much wider audience? Medieval manuscripts used to be available only to a few until the appearance of moveable type. Why did these scholars fail to discuss the Internet and its uses in the twenty first century? In the question period one member of the audience asked if Venetian studies might go into decline in this century after a meteoric rise in the past century. This question finally elicited a spirited if inconclusive discussion among the panel. Ironically, the discussion came to an end after an Italian scholar in the audience lamented the decline of modern Venice. Actually, he claimed that Venice was dying, not so much because of the threatening waters but from contemporary mis-management and corruption. It was a somber end to the roundtable. I will only say a few words about the next two panels I attended, both under the title, “Art. Architecture, and the Artist in Renaissance Venice.” First, the future of Venetian studies would appear to include an excessive interest in funerary tombs and monuments. It is as if scholars, both old and new, believe that all that needs to be said about the great masterworks of the Venetian Renaissance has been said. Now they will work in fallow fields of little artistic value. Second, one of the speakers gave an example of how not to present a paper at a conference. She did choose a large subject and even warned that she might have too much material. Participants are limited to a twenty-minute presentation and usually you can only read ten pages in that time. So one would expect that that the paper be edited carefully and discussion limited to a few examples. Instead, the professor just chose to read her entire paper at breakneck speed. What could she have been thinking of? Finally, my day ended with another roundtable, a kind of summing up of the Art and Architecture series. This roundtable included a number of other luminaries. The room was packed with expectant listeners. The tone, however, was set by one of the three chairpersons who introduced each of the eight participants at length. Her introduction took almost 20 minutes of the allotted 90. I frankly can’t remember anything that was said by any of the participants. It was an exercise in non-controversy. I do remember that they were all women, a fact pointed out by someone in the audience during the question period. Most of the people in the room were also women. Art History has become a province for women. This issue was never raised at the conference. What is the special appeal of Venice and its art to women? Why are men not interested? Maybe these questions could be addressed at a future conference.